Have you ever found out about an exciting new plant or gardening product only to realize you have no idea where you can get it? Are you new to the area or still trying to figure out where you can buy plants and gardening supplies? If so, Chatham County Extension Master Gardeners have created a resource just for you! 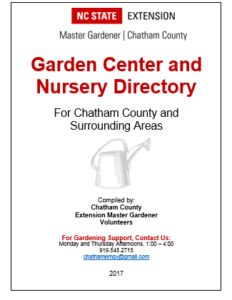 To help gardeners find plants and gardening supplies in Chatham County and surrounding areas, Chatham County Extension Master Gardener Volunteers have compiled a directory of farms, nurseries, garden centers and businesses that sell plants and gardening supplies to the general public. Click here to download the Garden Center and Nursery Directory. In addition, all garden centers, nurseries and garden supply retailers located in Chatham County have been listed on this webpage for quick reference. We encourage you to support Chatham County farms and businesses by buying local whenever possible! PLEASE NOTE: This directory was assembled for informational purposes only. Inclusion of a business in this guide does not imply endorsement by the North Carolina Cooperative Extension Service nor discrimination against businesses not listed. — Written By Charlotte Glen Have you ever found out about an exciting new plant or gardening product only to realize you have no idea where you can get it? Are you new to the area or still trying to figure out where you can buy plants and gardening supplies? If so, Chatham County Extension Master Gardeners have created a resource just for you! To help gardeners find plants and gardening supplies in Chatham County and surrounding areas, Chatham County Extension Master Gardener Volunteers have compiled a directory of farms, nurseries, garden centers and businesses that sell plants and gardening supplies to the general public. Click here to download the Garden Center and Nursery Directory.